Kibbutz Reim had to convert salty groundwater into a high quality irriga­tion resource in this desert-like region. High recovery was essential to this customer, both because of the limited amount of groundwater available and the challenge of brine disposal from their inland location. The source of feed water was a flood catchment source, and the water had high silt density, variable salinity ranging from 3,500 and 7,500 ppm TDS and old rust­ing pipes that contaminated the water with iron. Suspended solids and iron were supposed to be removed by pretreatment before being fed to the Re­Flex units, but the proposed pretreatment system was not installed until years after the systems were started. After the units had been operating for a few months, pumping from the aquifer nearly doubled the feedwater salinity. 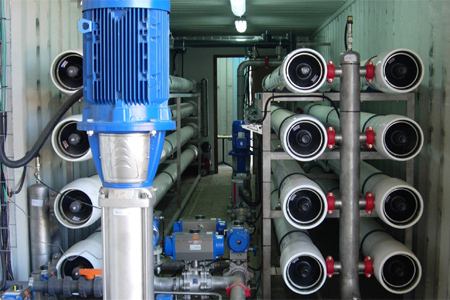 Lack of pretreatment and changes in feedwater quality are problems that commonly shut down conventional RO systems. However, continuous high performance operation was essential for this water-critical application. In addition, the high cost of power at the site made low energy consumption important. Desalitech installed a ReFlex Max 100 unit at the site in February 2009 and a ReFlex 150 unit in November 2009. Both have been operating continuously since then at 70 to 93% recovery with single stage membrane element ar­rays while consuming up to 45% less energy than a conventional RO system operating under the same conditions would require. The high cross flow and even membrane flux distribution inherent with CCD technology allow the ReFlex units to resist the fouling and scaling that normally clog and damage RO membranes. Therefore the systems were able to perform reliably for over 3.5 years despite the lack of pretreatment. Since the installation of basic media filtration, membrane cleaning frequency dropped to less than once per year. The flexibility provided by CCD technology allow the ReFlex units to adapt to the significant feedwater quality changes automatically, providing water security for the customer’s agricultural operations.